Courtney Somerville, a Richmond native, is going a great distance — more than 4,000 miles —to fight cancer. She is participating in the Texas 4000, the world’s longest annual charity ride from Austin to Anchorage, Alaska. Her 43-member team of mostly University of Texas graduates will complete the Rocky Route through Oklahoma, Colorado, Wyoming and Montana before reaching Canada by mid July. To date, Somerville has already ridden more than 1,000 miles on her Felt F85 road bike. Her mother Kathy Somerville is her inspiration. Her mother died in 2007 at age 58 after a two-year battle with Stage IV lymphoma. “I felt like a victim. I felt like something was taken away from me. I sat and watched, but I couldn’t control what was happening. This is a way for me to do something about it,” said Somerville. “This is a very unusual challenge. It’s a huge time commitment with several months out of her life. I think it’s good for her. She’s never shied away from anything. She goes out and gets things done,” said Somerville. Miriam Westmoreland has known Somerville for more than a year. “I think this stems from the frustration from losing her mom at such a young age. She can take charge. There wasn’t anything she could with the lymphoma. I’m more surprised because this is a new sport for her. I think the whole accomplishment will be something,” Westmoreland said. Somerville was raised as an only child in Richmond and attended Calvary Episcopal School at 1201 Austin until the eighth grade. In 2001, the Somerville family moved to the Memorial area. After graduating from Episcopal High School at 4650 Bissonnet in 2005, Somerville started attending the University of Texas in Austin. During her freshman year, she found out her mother had cancer. Somerville, who had never done any biking before, heard about Texas 4000 through a donation request letter. “I never thought it was something I could do,” said Somerville. 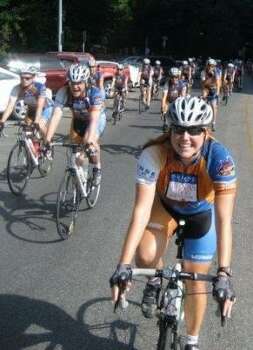 She began spin classes and applied for the Texas 4000 team. “I thought let’s see what happens. When my mom died, I got depressed. I started enjoying spin classes. I was accepted for the team in the fall of my senior year at UT. This is based on a passion for the cause,” Somerville said. Her ride began on June 6 and will be completed by Aug. 14 in Anchorage, Alaska. Funds raised to date by Somerville are $68,250.00. Somerville is most surprised by the generosity and support given to the team on the road. “We sleep in high school gyms, churches and sometimes family homes. We rely on donations for food because our food budget is so small. People have more than been willing to help us. It’s restored my faith in humanity. It’s nice to see how welcoming everyone has been,” said Somerville. She was also shocked by a monumental donation to her cause when she received a check for $50,000 from an anonymous donor. “I was shaking and crying. I couldn’t believe it, especially because it’s been such a tough year economically. I showed it to my team, and they started crying, too. All the money goes to M.D. Anderson Cancer Research Center. I’m going to make it!” Somerville said. Overall, Somerville said it’s the relationships she has developed with other team members that will stay with her. “They’ve been a great support group for me because so many people my age have been affected by cancer. The support has been awesome,” said Somerville. For details, go to www.Texas4000.org.